Join us for the first edition of CAMP! Many of us queer people and outsiders didn’t have the opportunity to experience the joy of summer camp when we were kids. It’s our aim that you find that missing piece here. Let's come together, unplug from social media and the culture of hyper-connectivity and tap into our childlike sense of wonder and freedom. We aim to focus on self-empowerment and self-esteem building through activities of a traditional summer camp experience. We also offer chats and workshops (SPECIAL GUESTS announced soon) that will guide you towards finding the necessary tools to connect to your soul purpose and the basic blueprint on “how to do life.” Come climb ropes, practice yoga, try archery, hike mountains, go mountain biking, explore arts and crafts, try the climbing wall, take river walks, meditate, attend fireside facilitated chats, play music, make friends and so much more! Let down your guard and get in touch with yourself, nature and your community. Having good old-fashioned fun is essential to having a great life. In the modern world, we are expected to be busy and hyperconnected. Our society prizes multitasking and as a result, we are often mentally cluttered and stressed out. Through our heavy online presence, our real life connection and community suffer. Subsequently, our quality of life, potential for happiness and clear understanding of our soul purpose are diminished. As we get older, it becomes increasingly difficult to develop real human connection. By the time we hit our mid-twenties, we can live our lives in a small circle of only knowing a few people in the same industry, having a predictable routine and grinding for a vacation. By the time many of us turn thirty, life seems like a struggle with finances, relationships and career goals. We often sacrifice self-care and our dreams for security. An abundant life is available to all of us! The Magic Hour Club Camp will help you Reconnect with what actually matters to you. ﻿﻿﻿﻿﻿﻿﻿﻿Nestled in the beautiful majestic mountains near Big Bear, about 2.5 hour drive from LAX and an hour drive from ONT airport. 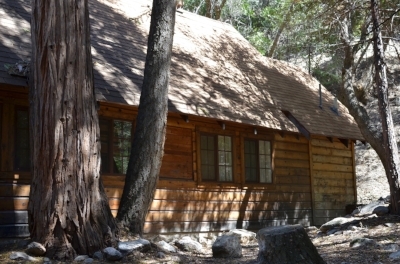 The campgrounds are surrounded by towering pine and cedar trees, alongside the melodic sounds of the Santa Ana River, a breathtaking rustic historical landmark. The elevation sits at 5,800 feet.﻿﻿﻿﻿﻿﻿﻿﻿ We will be providing a message board for ride-sharing. Slumber party!!! You’ll be sharing your rustic-style cabin with somewhere between 10 and 19 others. 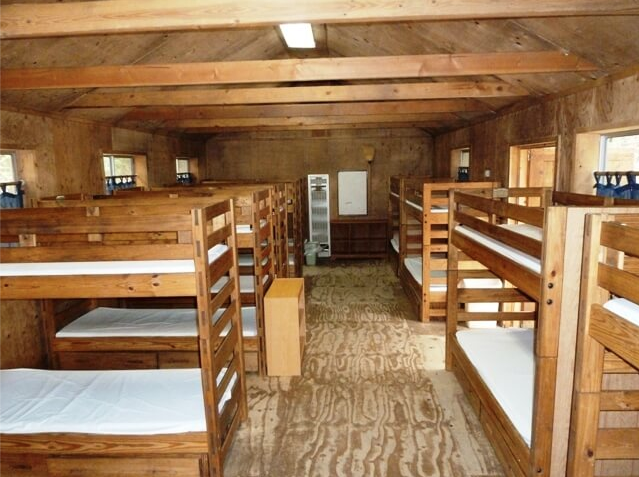 Cabin groups are assigned with your comfort and happiness in mind. If group cabins are not your thing and you would prefer to camp in a tent, the land has space for that. Be sure to select that option at checkout. There are shower and bathroom facilities within a short walking distance from camping and cabin area, as well as some cabins having multiple amenities. The land and accommodations are rustic and rugged, so please understand this is not a bougie retreat. The camp does not provide linens, so we suggest you bring your own sleeping bag and pillow or purchase through us in advance. Do you want to have so much fun in the woods with a bunch weirdo artists, mystics and queers? Do you want to experience a kids style summer camp with archery, high-ropes, lanyard making, team sports and so much more? Do you want to unplug for a weekend and make a bunch of new friends? Do you want to meditate, go hiking and do yoga? Do you want to learn and try new things in a space that is free from judgement and selfies? Are you looking for a way to spiritually connect that is not about social media and smoothie bowls? If the answer is yes, then this camp is for you! Camp is $390 all inclusive (plus registration fee). You can reserve your spot today with $100 nonrefundable deposit, with the remainder of the balance due by Feb 1st 2018. If cost is prohibitive, we will be offering a limited amount of full and partial scholarships. We will open the application process in the beginning of 2018. Stay tuned for details. We have more answers in our FAQ section. 3 meals a day plus snacks and beverages - we work with the camp chef to design vegetarian, vegan, and gluten-free menus and options catered specifically for our group and to accommodate food allergies. Access to all activities offered. Payments are not transferrable under any circumstances. Our cancellation penalties are non-negotiable. We suggest securing travel insurance should you need to cancel Camp due to unexpected illness, injury, or other emergency.